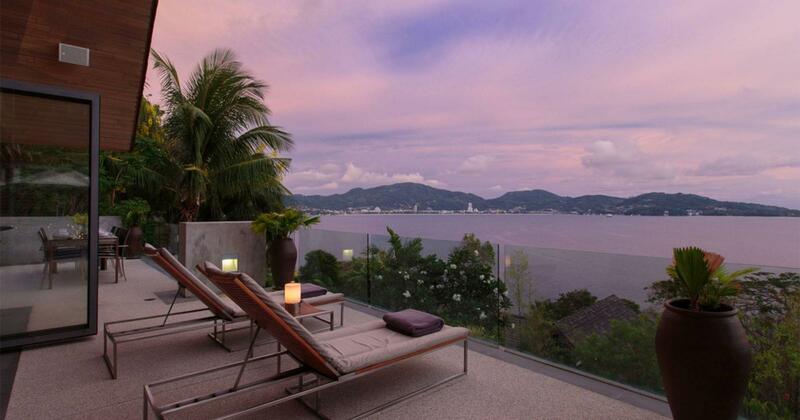 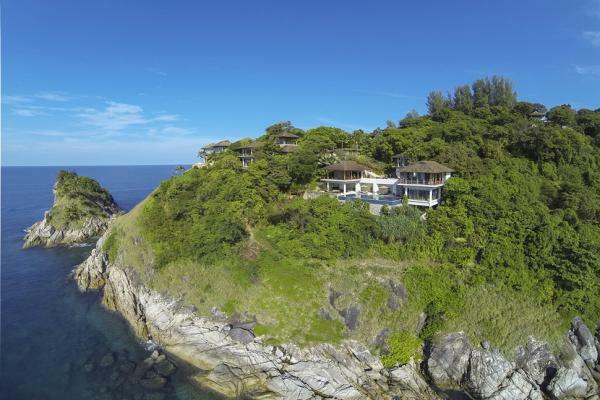 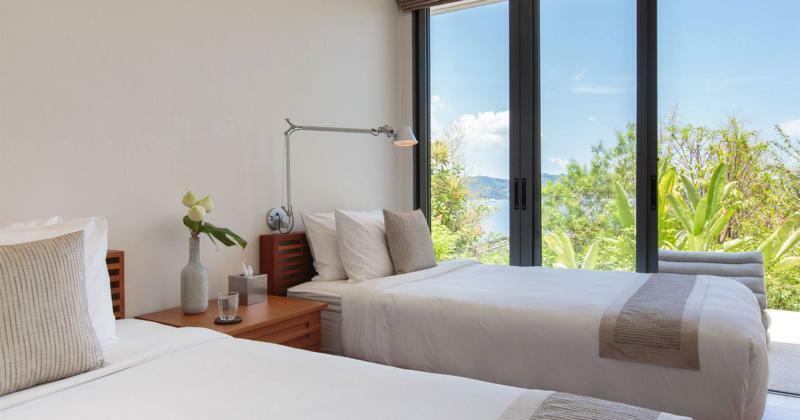 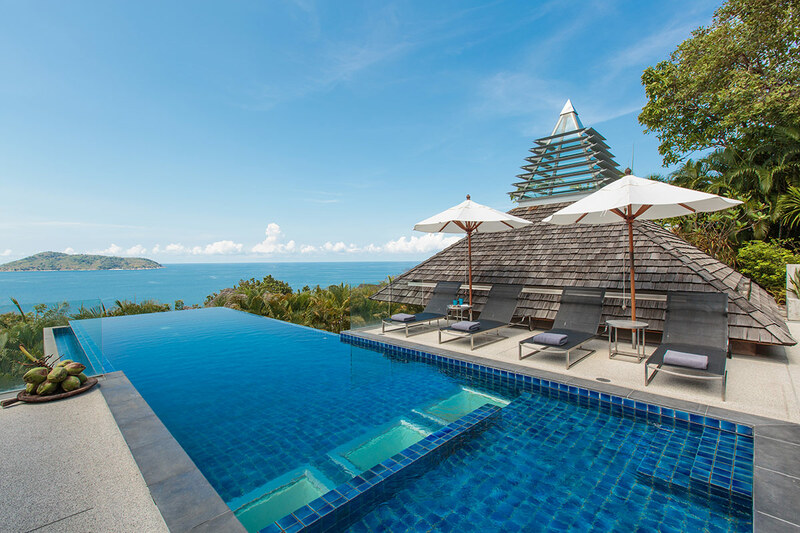 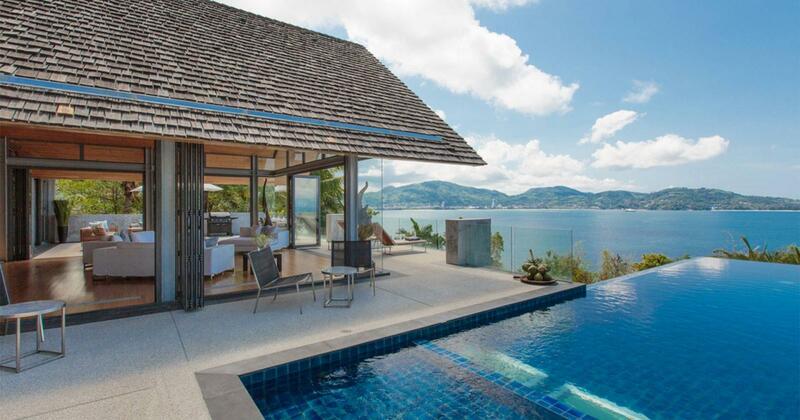 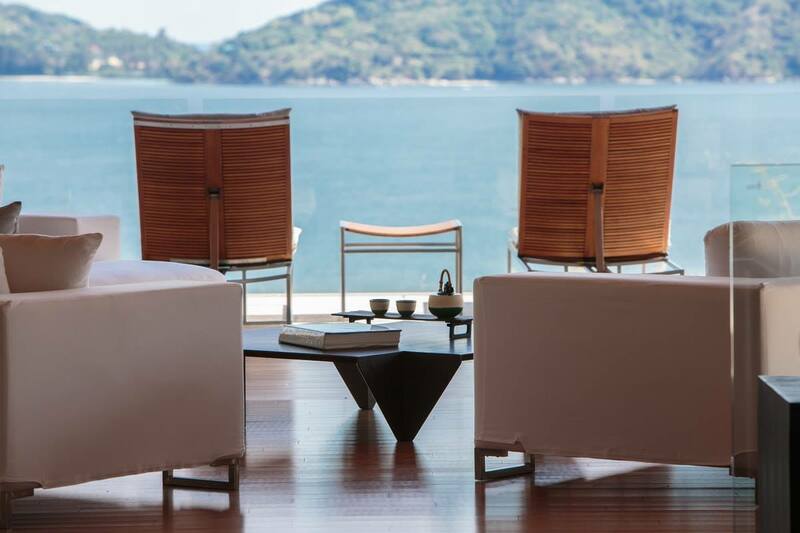 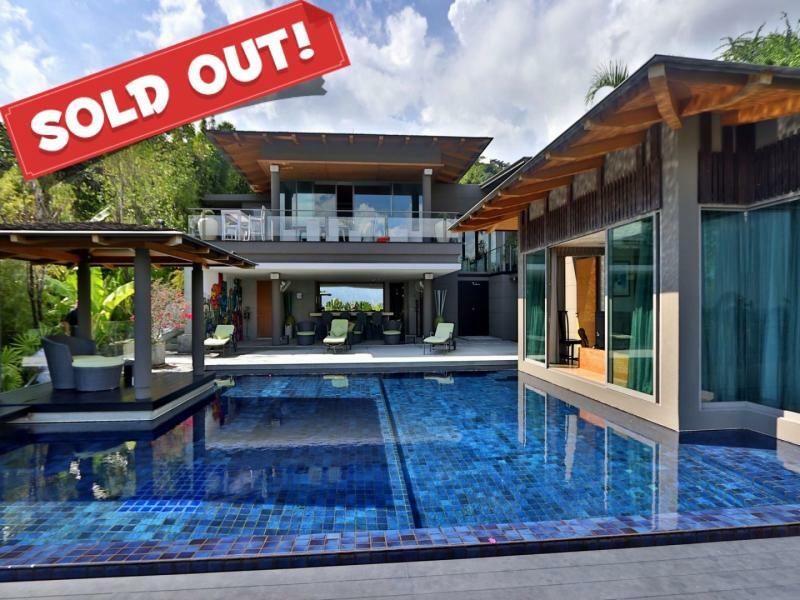 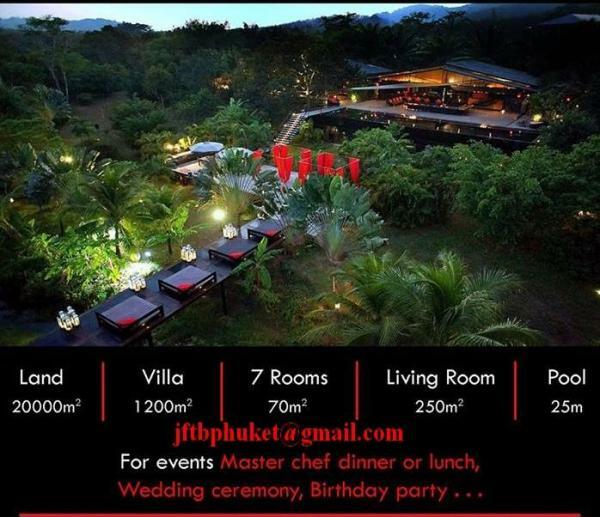 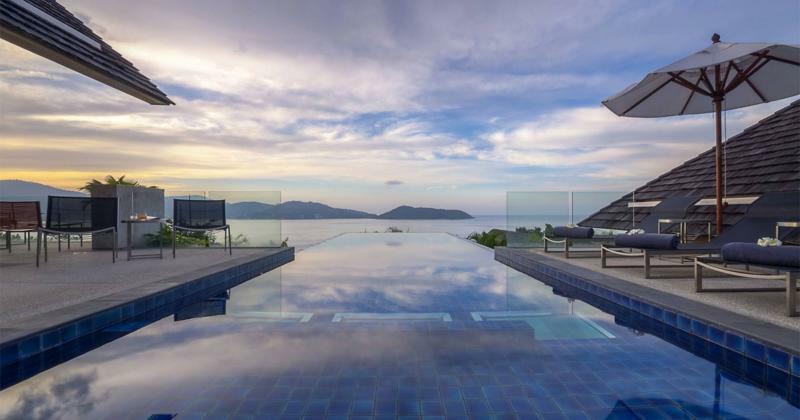 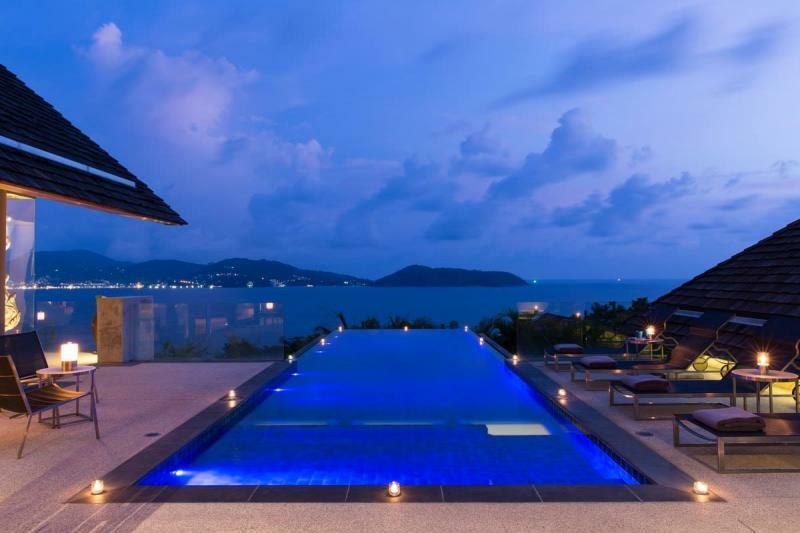 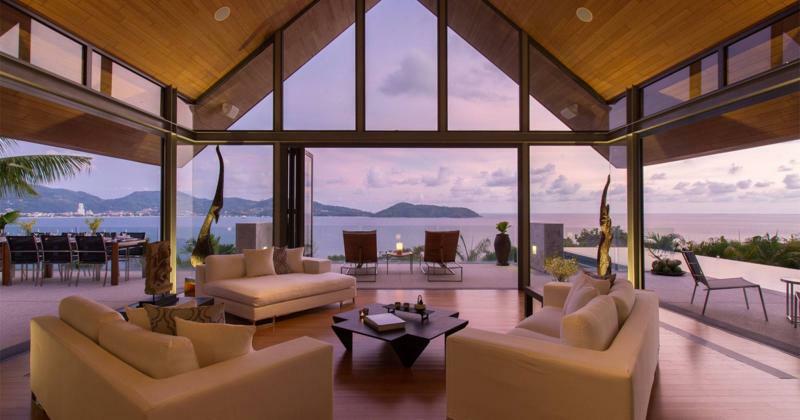 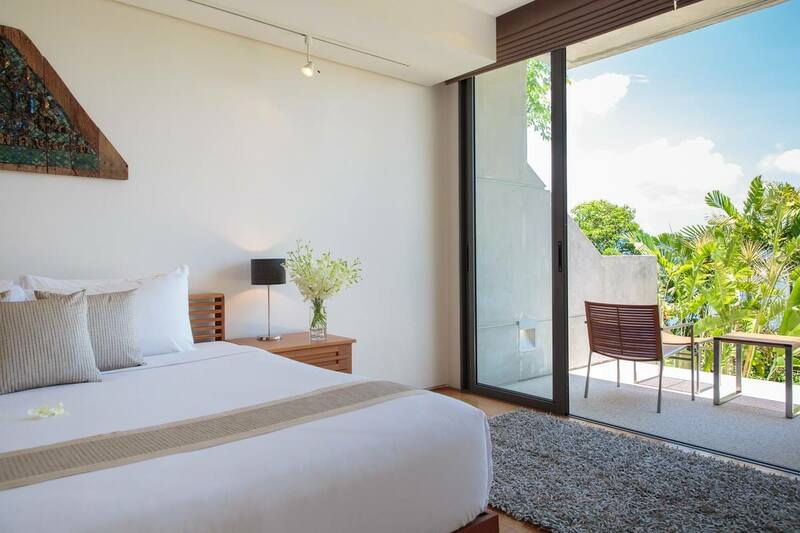 Thailand, Phuket, Kamala, Millionaire's road: this stunning high-end luxury villa occupies a breath-taking and very unique location which provides stunning 270 degree sea views encompassing the hills, town and beach scapes of Patong Bay out to the Andaman sea and sunset. 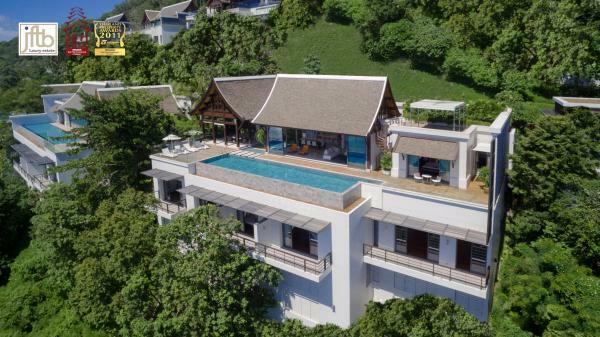 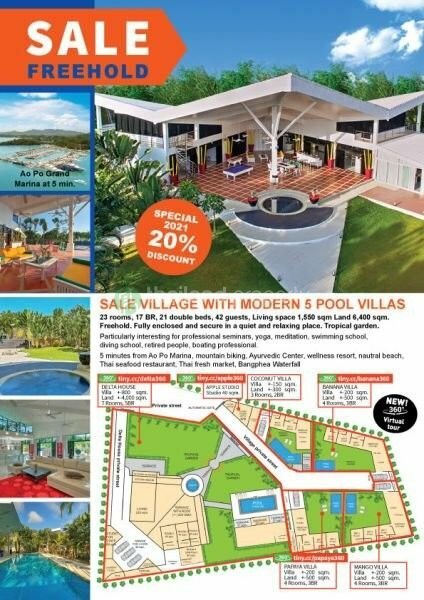 This prime location would be very difficult to beat, located along the ‘Millionaire’s Mile between the marvelous Kamala beach and South East Asia’s night-life capital, Patong Beach. 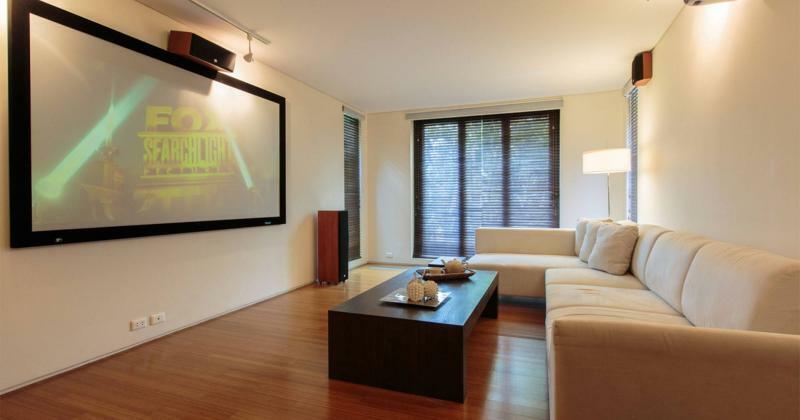 Both are easily reaching within less than 10 minute drive. 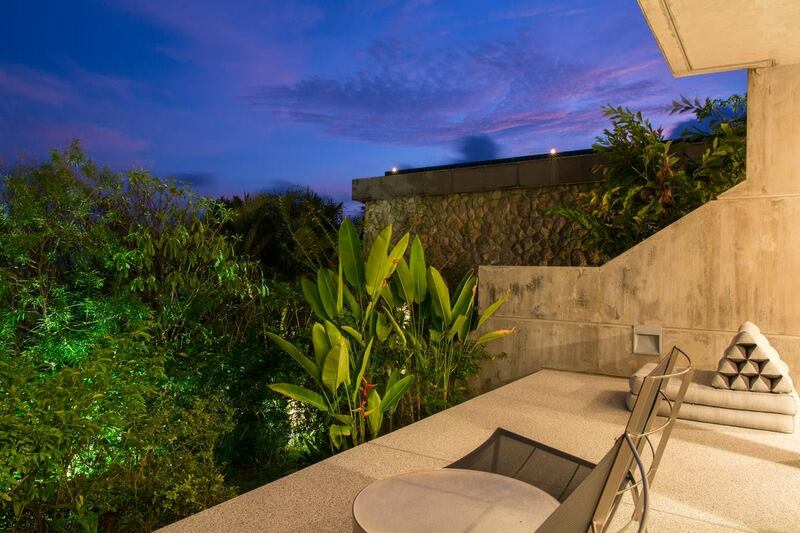 This 5 bedroom villa has a a living area of 800 m2 over 2 main levels. 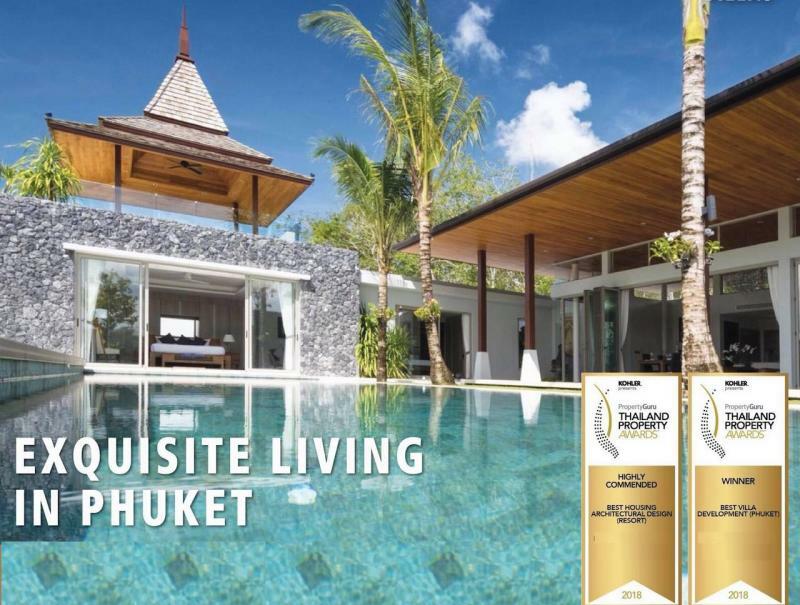 The property is setting on land size of 3,000 m2 with Chanote title, including 2 plots in the estate. 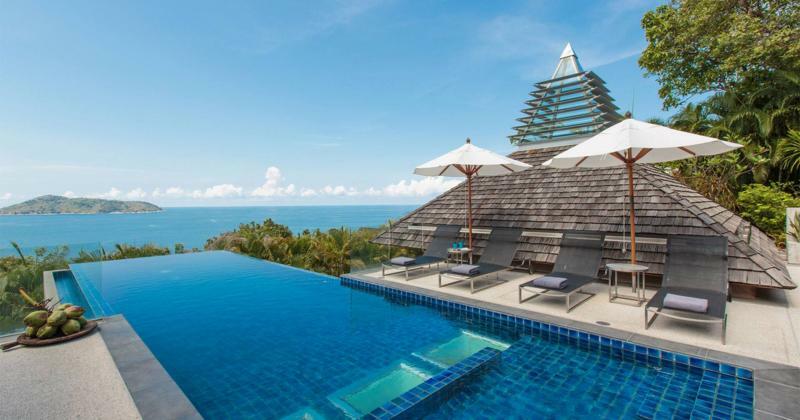 The villa is on a plot of 1,608 m2 / 1 rai. 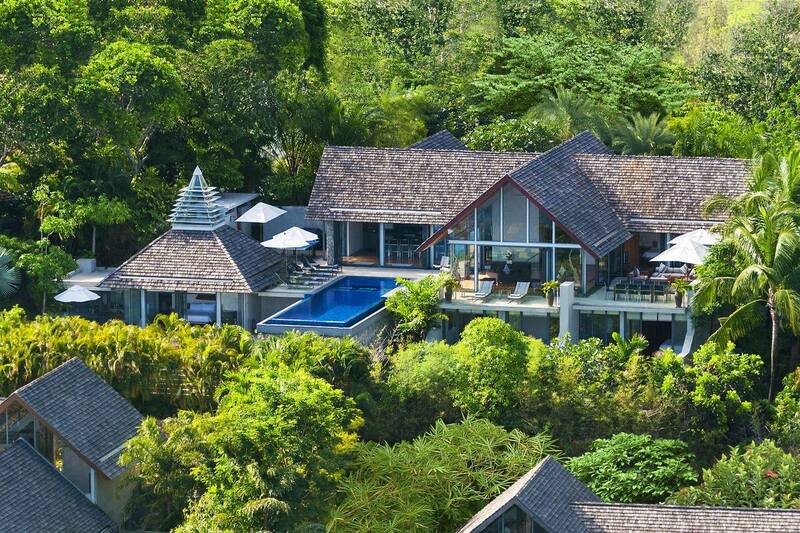 And the other plot of 1,400 m2 is used as a landscape garden. 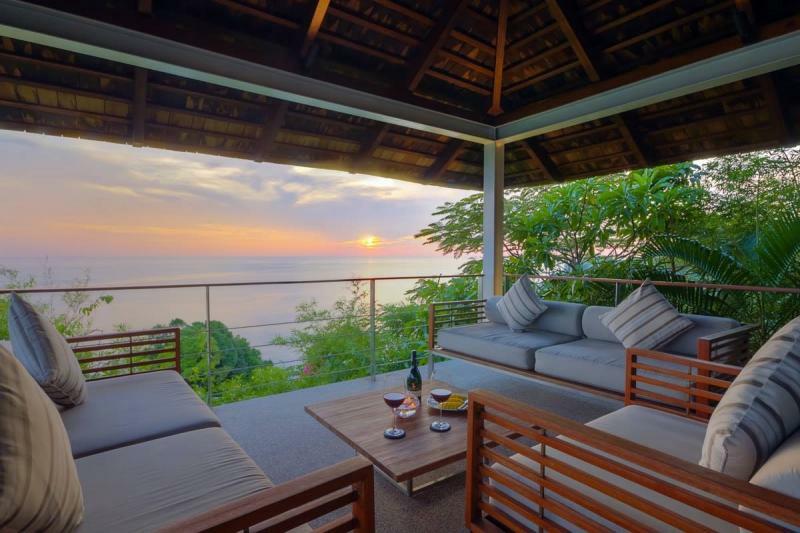 This additional plot can be sold on or built upon by the new owner, to either increase the size of the villa or to build a new sea view villa. 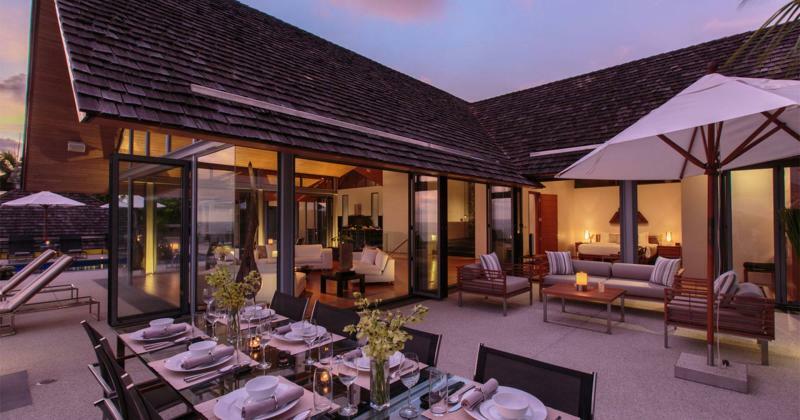 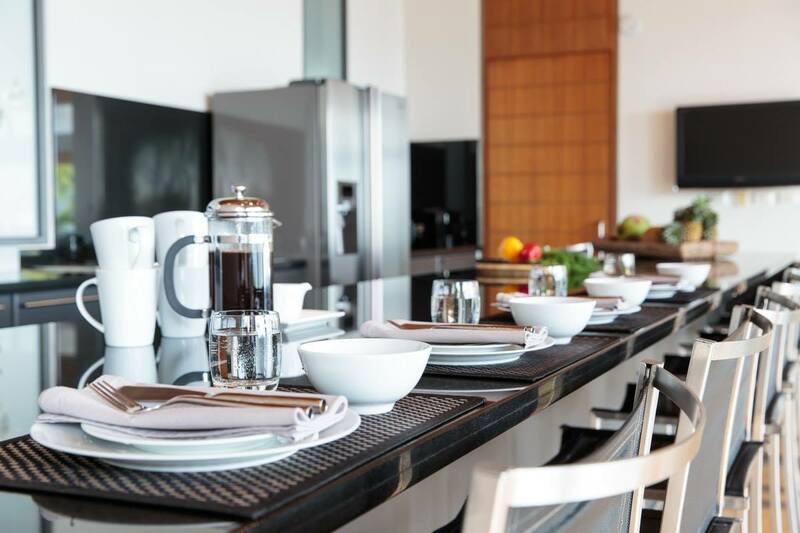 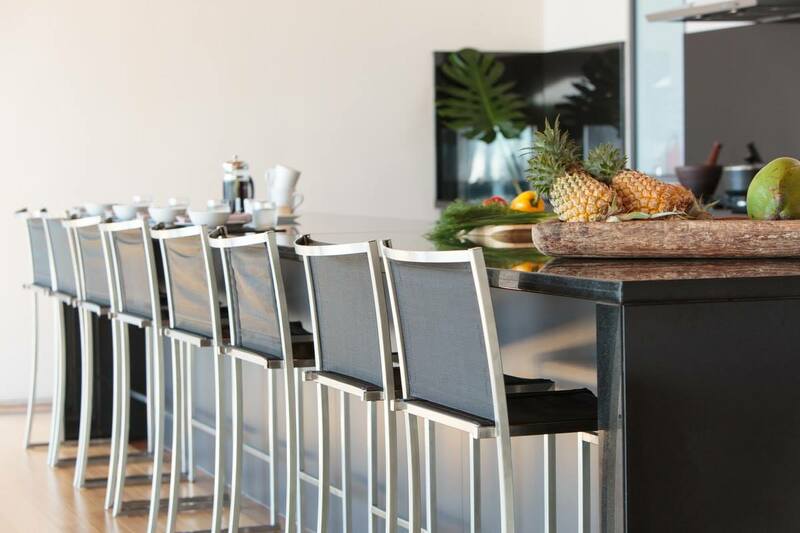 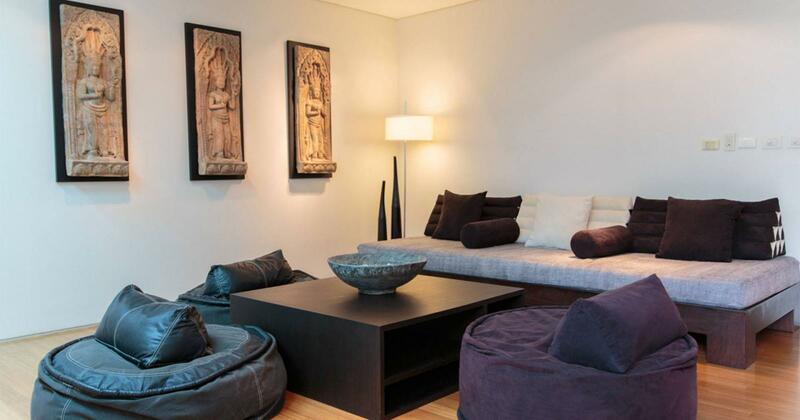 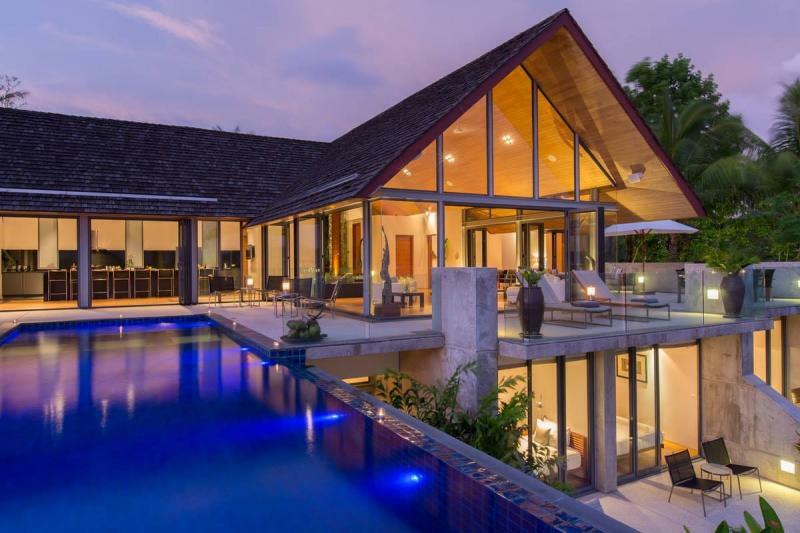 This luxurious modern villa features expansive living and entertainment areas. 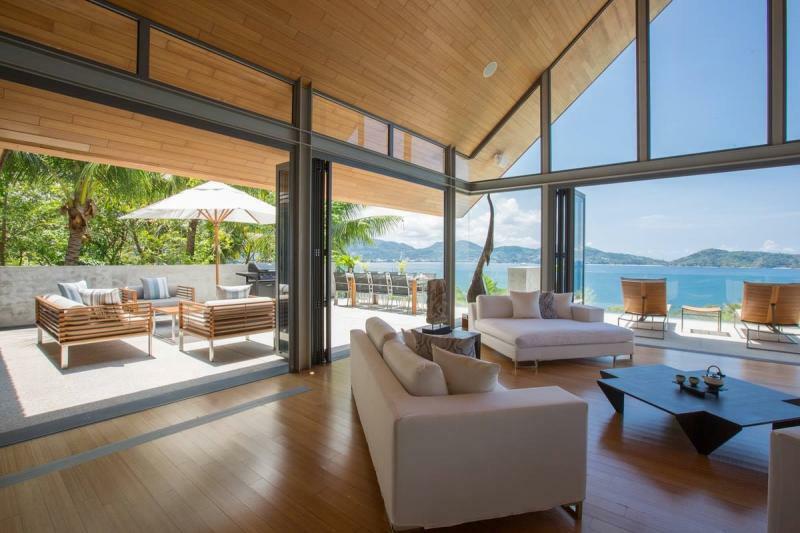 The house's upper living room open directly onto outdoor decks. 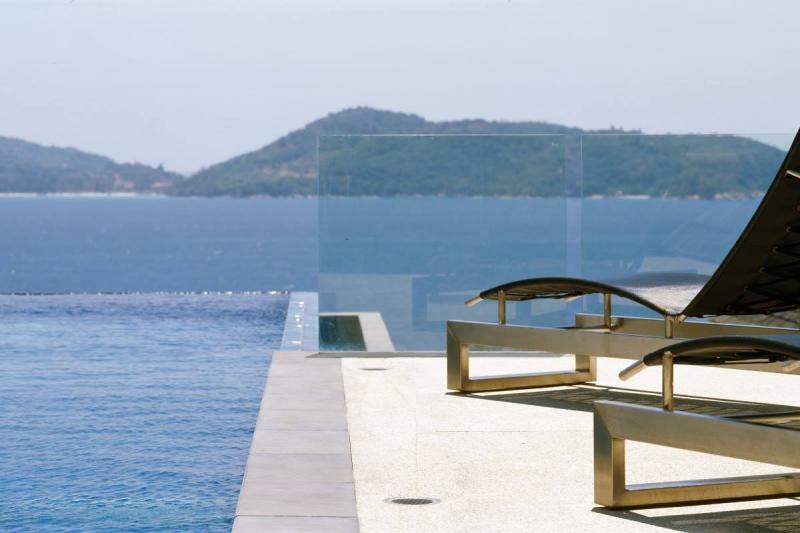 Outdoor dining, barbecue, and sunning areas complement a stunning 14 meter infinity-edge pool which appears to stretch far into the horizon. The pool incorporates a shallow area for children and glass panels. 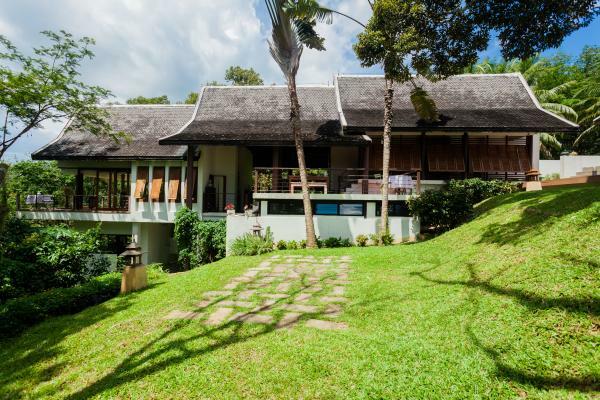 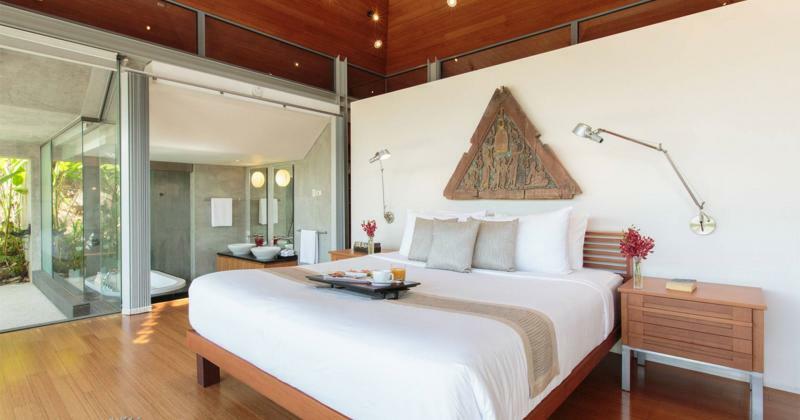 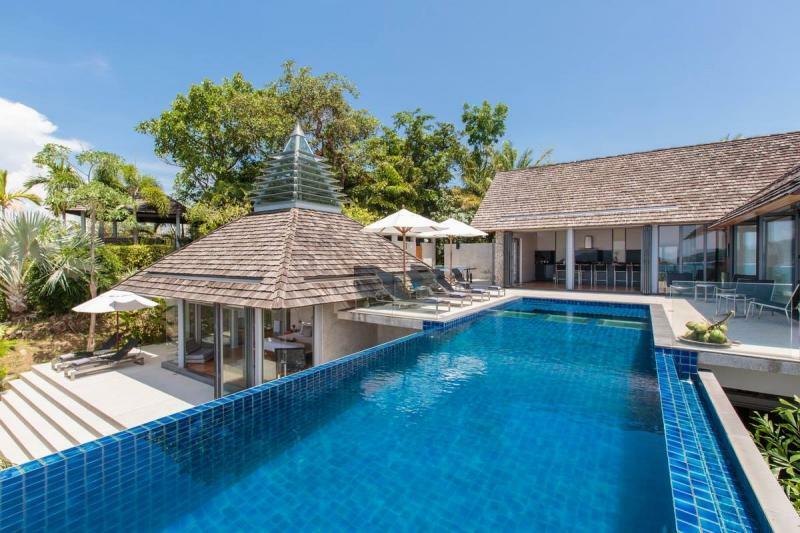 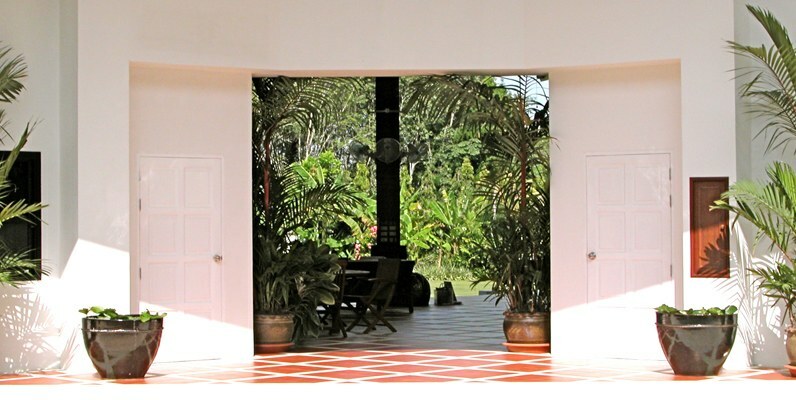 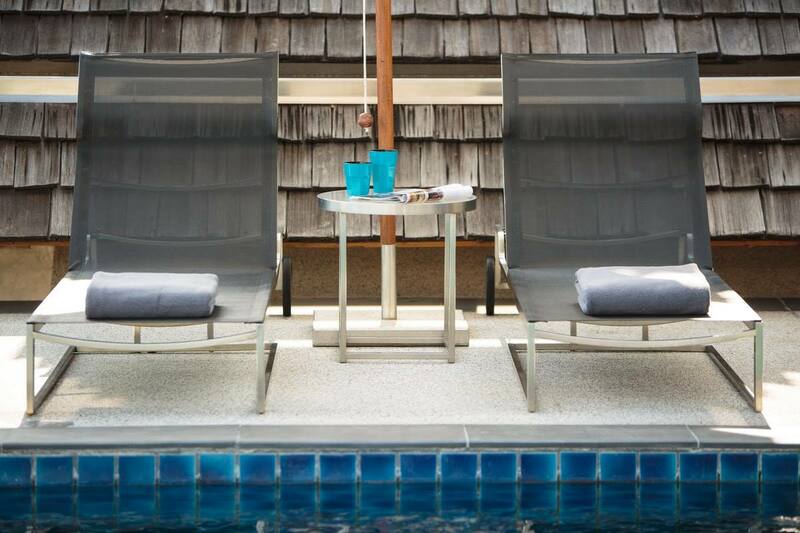 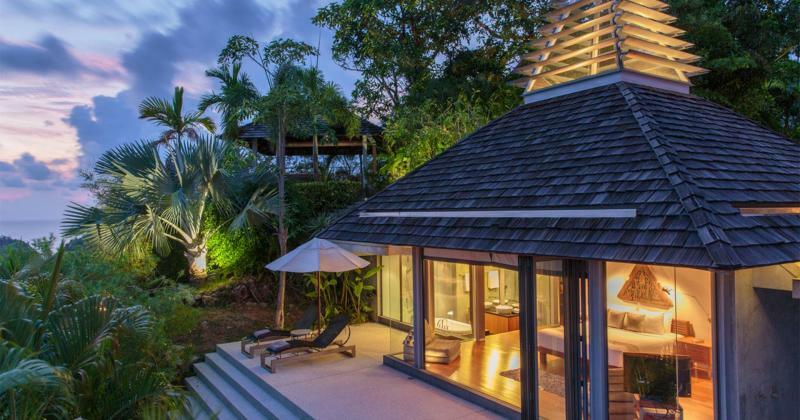 A small path from the pool deck leads to a large open-air detached traditional Thai Sala.